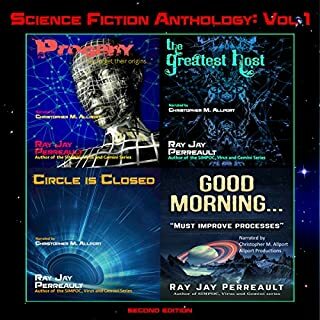 Four sci-fi short stories where you'll find good computers, people who regret their past, and an explanation for something you're familiar with. All the stories were very engaging and entertaining. My favorite character was the lead researcher robot who was interested in "recombining" humans. She was my favorite because of her curiousity. Which character – as performed by Christopher M. Allport – was your favorite? The base computer on Good Morning. He managed to convey a slight hint of danger without breaking character. When I realized that there was a surprise in the anthology! I received a free copy of this audiobook for an honest review. I've had troubles finding new true sci-fi authors to check out and I was pleasantly surprised. I will definitely read more of his stories.